We are a small San Francisco salon, located in the Lower Haight, that services both men and women for all their hair care needs. With a passion for all things hair, we strive to give you an amazing experience from start to finish. We take great pride in the little details, while providing a comfortable and cozy, yet fun environment that sets us apart. Whether in need of a classic or edgy haircut, or gorgeous color, Dolled & Dapper Salon is here to customize each service for every one of our guests. Book an appointment today! Dolled & Dapper is owned by stylists, ANGELINA PASION and FIONNUALA McGARRY. The two met at beauty school and worked side by side for years during stints at Diva International Salon and the Barber Lounge in San Francisco. In 2013, they opened the doors to their own salon - Dolled & Dapper. JOIN THE TEAM... WE ARE HIRING! 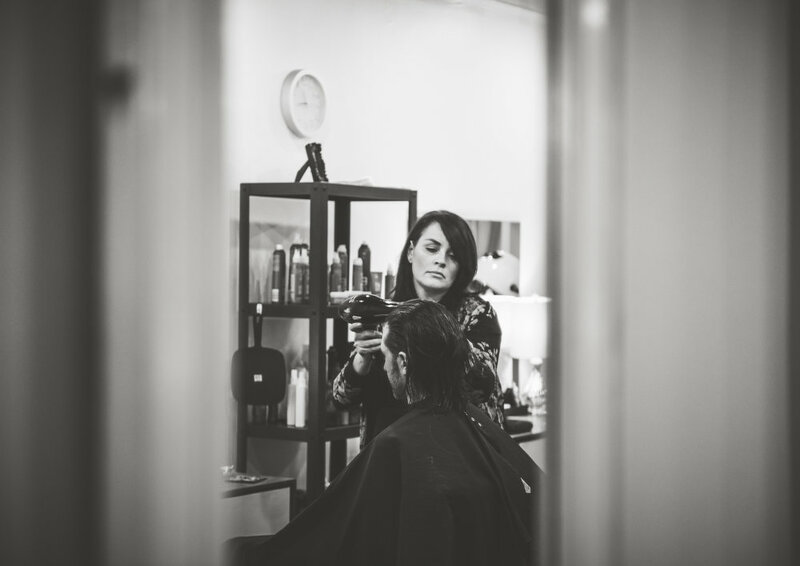 Fionnuala, originally from Ireland, started working in salons at the age of 14. With a passion for hair, she went to beauty school and began her training. After moving to San Francisco, she continued her education at the Cinta Aveda Institute in the Financial District. Following graduation, Fionnuala trained in two high-end salons where she refined and grew her love for precision cutting and coloring with a background in Aveda, Wella, and Sebastian. She is an avid learner keeping her skills fresh and up to date with continuous education. Fionnuala’s attention to detail, while adding her edgy touch, is a unique part of her signature style! Angelina, known to many as Lola, is a San Francisco native. At a young age, she used her Barbies and dolls as her first clients, giving them the trendiest haircuts a 5 year old with plastic scissors can dream up! Angelina attended the Cinta Aveda Institute San Francisco, receiving a premium education. Since then, Angelina has worked at two high-end salons with a background in Aveda, Wella, and Sebastian. She is an expert in hair cutting, hair color, extensions by Perfect Locks, and styling for all occasions - especially weddings. She strives to keep up with the newest education and trends to keep her clients looking fresh and current. She delivers top notch customer service that is unique to each and every client making experiences with her fun and personable. Ginger is a professional stylist with more than 20 years of experience in the beauty industry. Among her extensive credentials, Ginger is an Advanced Deva Curl Specialist. She was inspired at an early age to do hair and apprenticed with top notch programs and training including: Toni and Guy, Bumble and Bumble, and Redken. Whether your hair is curly, tinted, wavy, or straight, Ginger will take care of all your hair needs. She prides herself in giving her guests a Gingerized experience. In her spare time, Ginger enjoys filmmaking, traveling, food, taking seminars, and enjoying life in the present moment. Come in and break through to the beautiful new you! Ginger is an Independent Contractor and operates her business out of Dolled and Dapper Salon. Her services, as well as prices, may differ from the salon and are performed by/at her discretion only. Contact her at 510-927-4104 or glgstylist@gmail.com. Our clients are our biggest supporters! Find out what they think about us. Dolled & Dapper is a full service San Francisco salon specializing in color, cutting, and styling for both women and men. Whether you're looking for haircuts, coloring services, extensions, or updos, our salon has you covered. For detailed pricing, please select the BOOK NOW button (pricing varies on the experience of the stylist). All of our color services are done with Wella Color and include a blowdry. Whether you're going lighter for the summer, richer in the winter or just covering those pesky grays, you're sure to love the shine and gorgeous refreshed color. Our prices vary based on the experience of the stylist and the length or thickness of hair. All of our cuts come with a relaxing shampoo and scalp massage, except our dry cuts, which get you in and out in 30min. For our dapper dudes, hot towels finish off your service! Need a fabulous style for a special occasion or just wanting beautiful bouncy hair? We love styling for any event! Please call or email us to schedule and for a quote for your on-site wedding services. Have a question? Please contact us for detailed pricing or for any special appointment requests, and we will do our best to accommodate you. Whether you're fighting frizz or want to make over your mop, Dolled & Dapper Salon provides rave results for every hair type. Select the BOOK NOW button below for detailed pricing (pricing varies on the experience of the stylist). We also have a 24hr cancellation policy. When booking, a credit card is needed to hold the appointment. In the event of a late cancellation or no show the card may be charged 50% of service booked, at our discretion.